An EU declaration that Northern Ireland could resume EU membership in the event of a united Ireland is "hugely important" but it does not bring a border poll any closer, the Taoiseach has said. 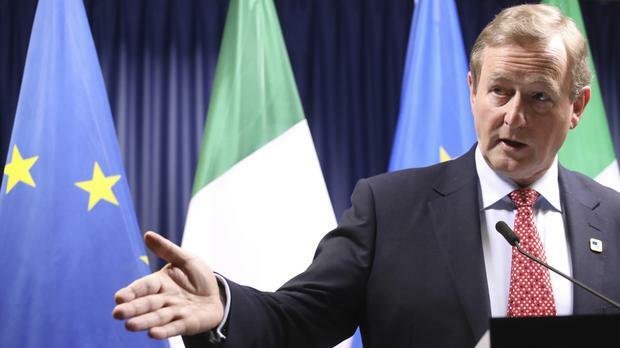 Enda Kenny said the move dispelled any doubt and uncertainty that had been created as a result of the Brexit vote. However, he made clear he does not believe the conditions for calling a vote on unity currently exist. Under the terms of the 1998 Good Friday Agreement, an incumbent Northern Ireland secretary can call a border poll in the region if he or she believes there has been a significant shift in public opinion in favour of unity. Mr Kenny pressed for a statement on the EU's stance in the event of unification to be attached to the minutes of Saturday's European Council summit. The request was accepted and the position will be formally adopted at the next council meeting in June. The statement is not part of the EU Council's agreed negotiating framework on Brexit. "Let me be clear, this is not about triggering any mechanism (for a vote)," Mr Kenny said after the summit. "I have been very consistent in my view that the conditions for a referendum do not currently exist. "But acknowledging the principle of the potential within the Good Friday Agreement (for unification) is hugely important." The statement to the minutes confirms that Northern Ireland would automatically assume the EU membership already held by the Republic of Ireland in the event of unification, rather than having to reapply. Precedent already exists in the case of East Germany becoming part of the EU after reunification with West Germany. Mr Kenny said: "The declaration about unity contained in the potential of the Good Friday Agreement is hugely important in order to dispel any doubt or uncertainty. "The only new thing here is Brexit and it is important to provide reassurance that it does not undermine any provision of the Good Friday Agreement and that if the provision on unity by peaceful means and by consent and democratic means is invoked at some time in the future EU membership is assured and it is now unanimously accepted by the European Council to endorse that legal base." Irish republicans claim Brexit has been a game-changer in respect of public opinion, and cite the recent Stormont Assembly election, in which unionists lost their majority for the first time, as evidence of the required shift in views. Unionists rubbish this assertion and insist opposition to Brexit should not be interpreted as support for a united Ireland. Mr Kenny was in Belgium as speculation about his own political future continued at home. He has been under increasing pressure to make public when he intends to step down as Taoiseach and leader of his Fine Gael party. Mr Kenny addressed the issue only briefly as he spoke to the media after the summit. "As for me, I'll be talking to my party soon," he said.